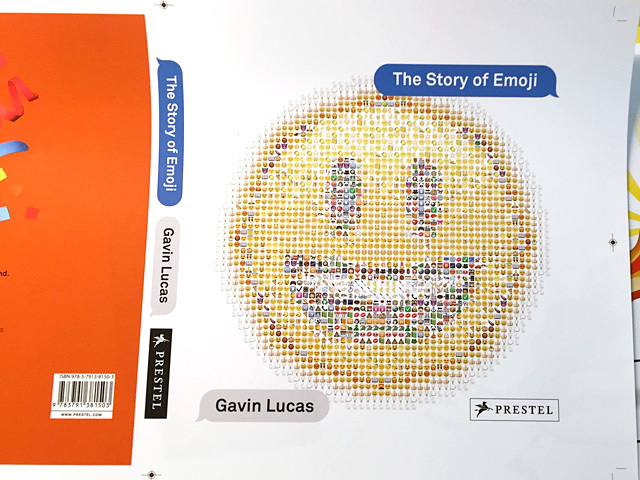 Munich-based Prestel Verlag commissioned FL@33 to design the book and cover of The Story of Emoji written and compiled by long-time FL@33-collaborator Gavin Lucas. 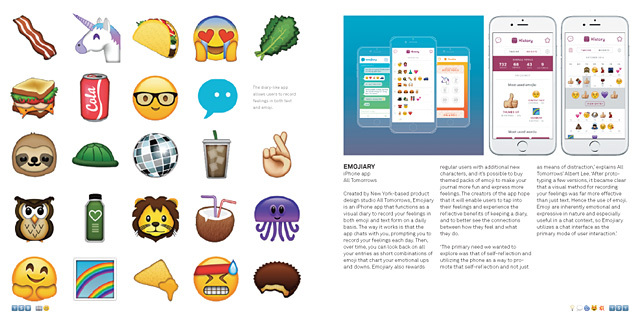 ___ The cover features our illustration of the 'Smiling Face With Open Mouth' emoji and was created using a variety of different Apple iOS emojis. 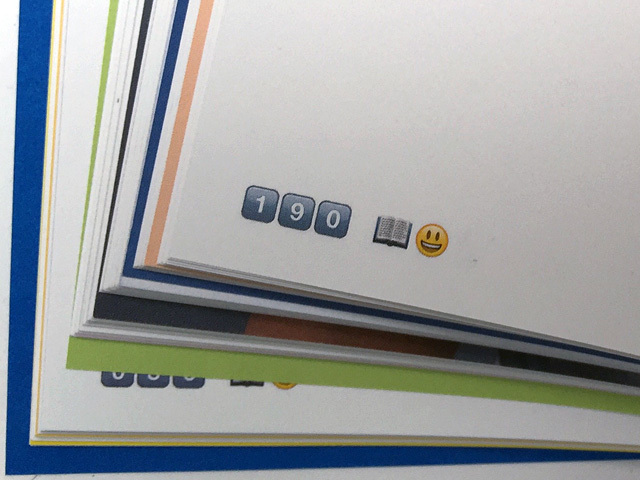 As these pictures of our advance copy show, the cover was printed using relief varnish to enhance each individual emoji. ___ The FL@33-designed book is due to be published in early Spring 2016. 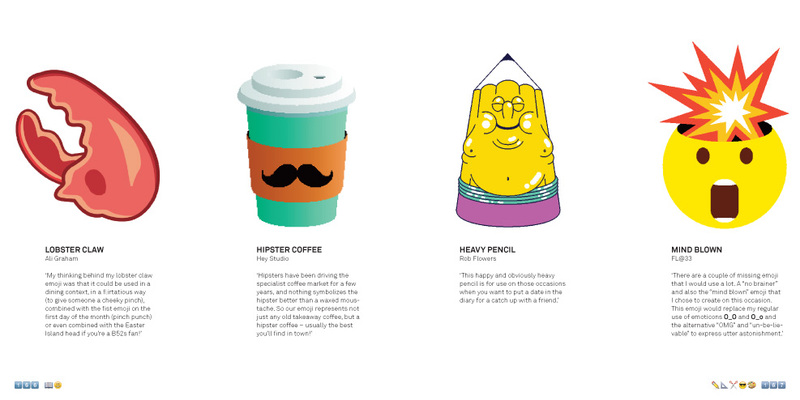 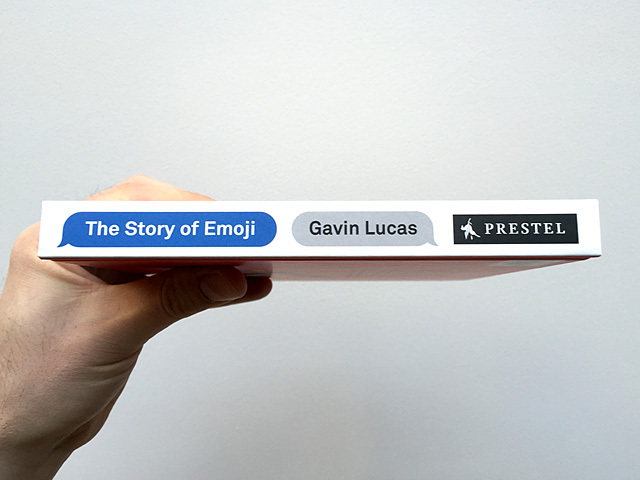 We posted sample spreads and also show our own custom emoji Mind Blown that we were invited to create by Gavin as part of a series of designer emojis he showcases in his book The Story of Emoji. 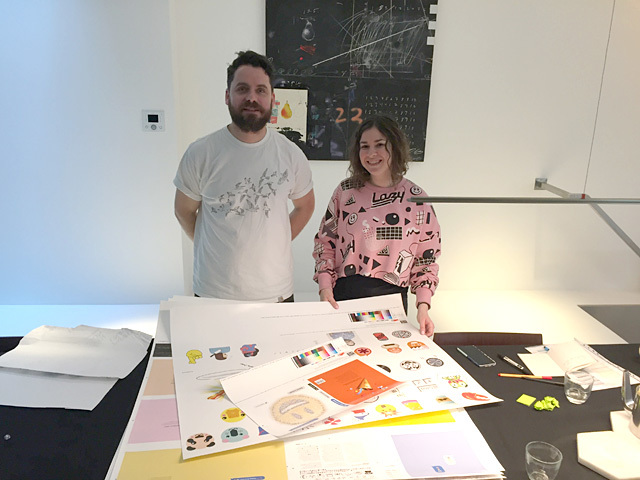 ___ No – not the FL@33 duo are shown here but the charming team that is the book's author Gavin Lucas and Prestel Publishing's Ali Gitlow – at FL@33 HQ to check scatter proofs with us. 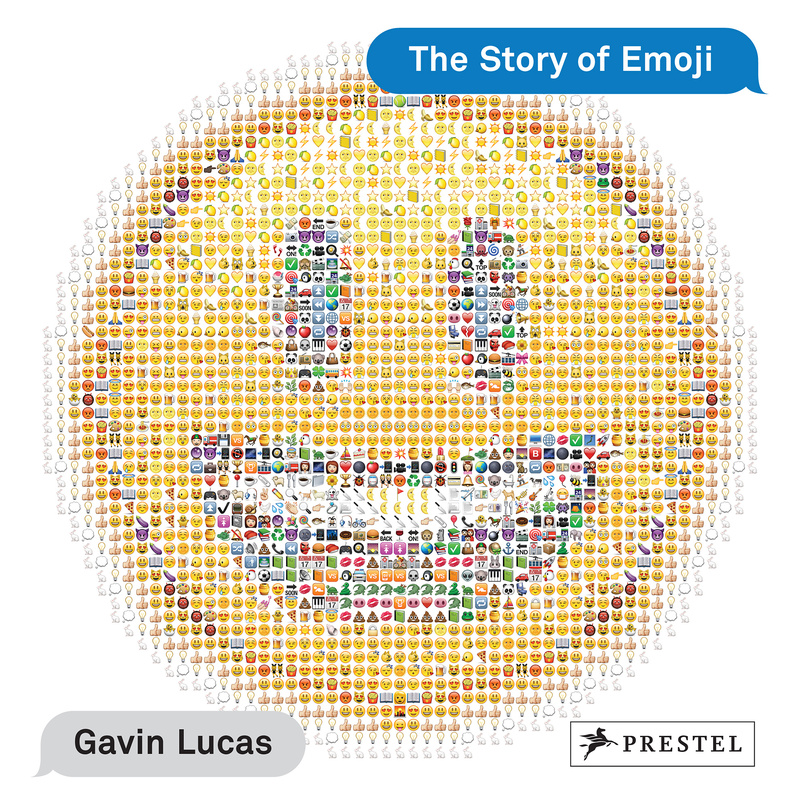 This is the first book to explain the genesis and cultural significance of emoji, the world's cutest and most popular form of shorthand. 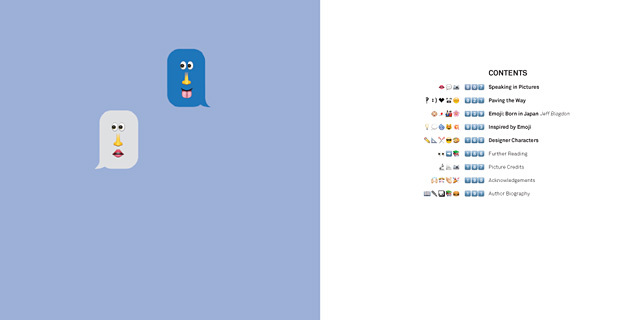 ___ If you have a Twitter account or regularly send text messages, it's highly likely that you ve used or received emoji. 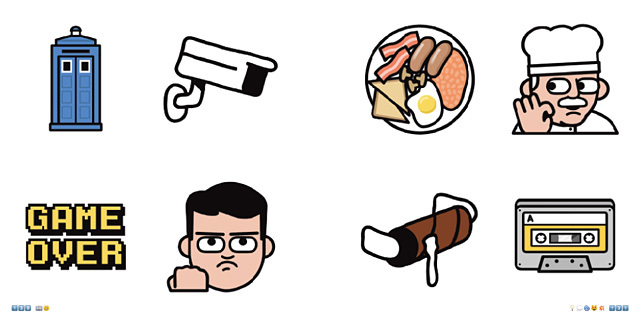 These characters include symbols and pictograms that represent a host of everyday objects and activities plus, crucially, a selection of faces that denote a range of emotions from happy to sad, angry, confused, surprised or tired. 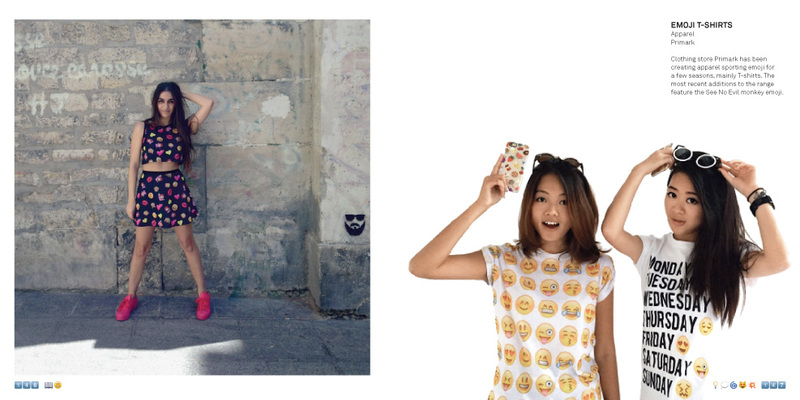 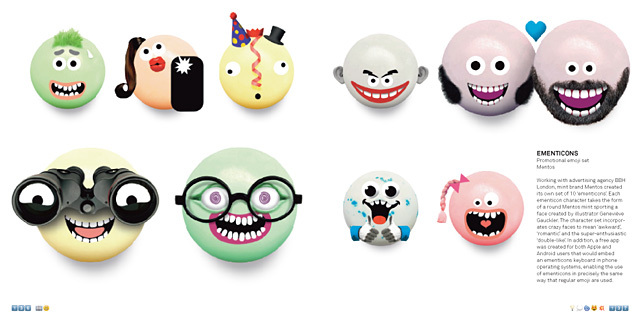 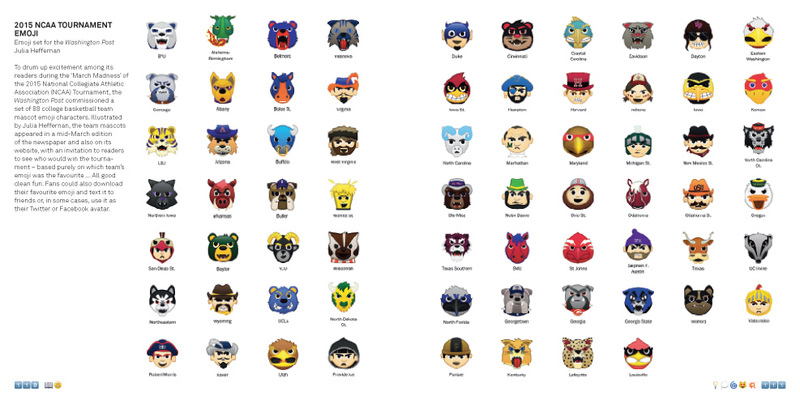 The word emoji literally translates from Japanese as picture (e) and character (moji). The Story of Emoji traces emoji from their origin as a symbol typeface created specifically for a Japanese mobile phone provider in the late 1990s to an international communication phenomenon. 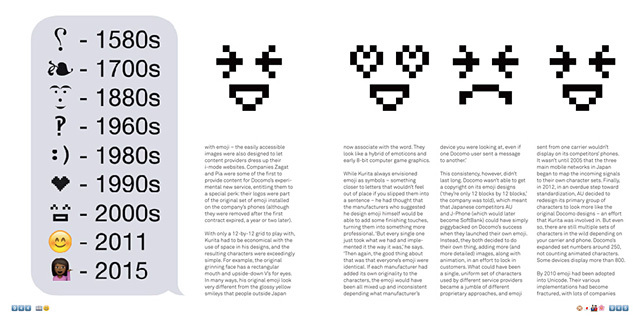 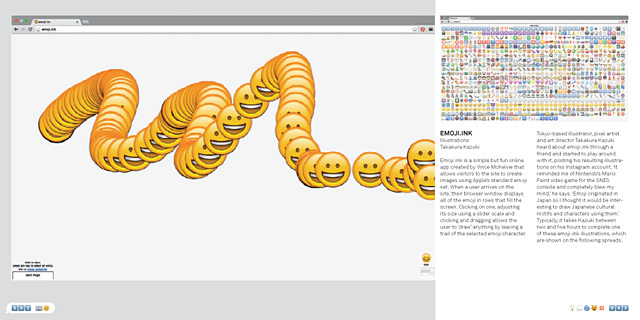 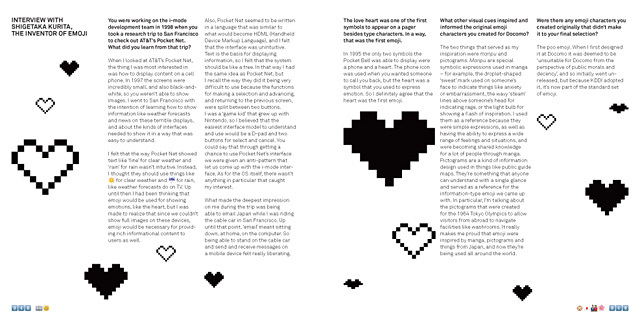 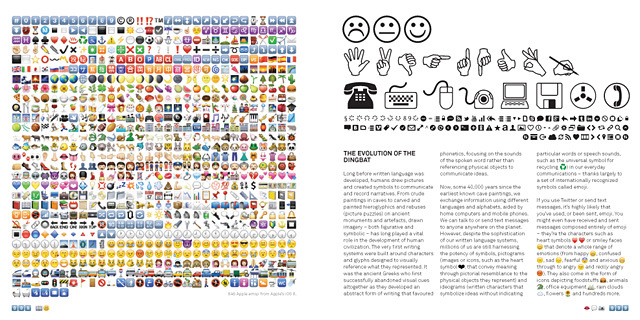 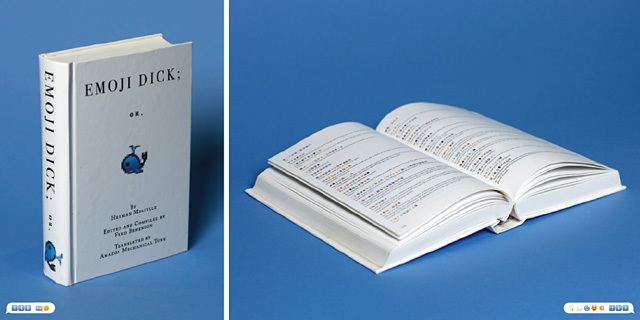 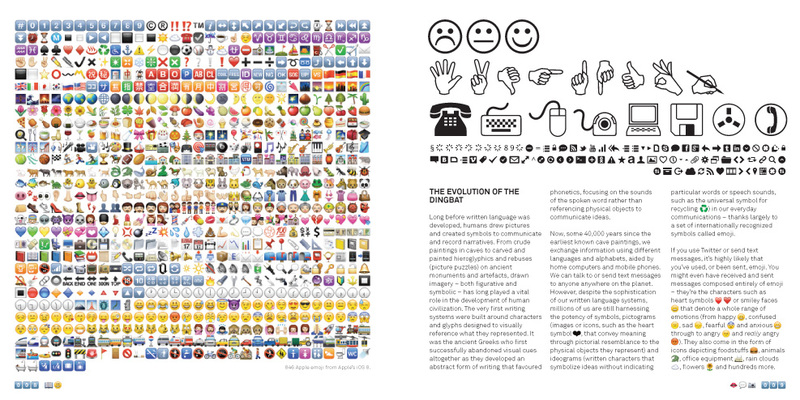 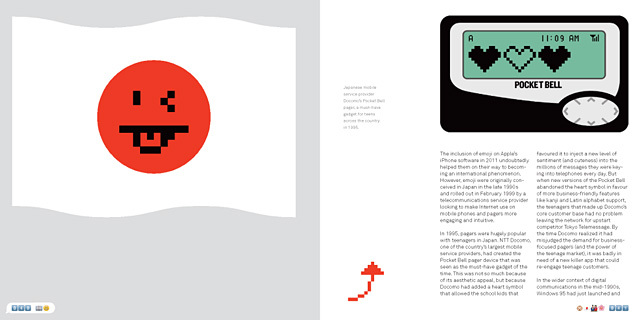 As well as a history of emoji and an interview with their creator, Shigetaka Kurita, the book includes an exploration of non-text typefaces, from the decorative fleurons of the early days of the printing press to the innumerable digital typefaces available today, to the use of emoticons, ASCII art, and kaomoji in typed messages. 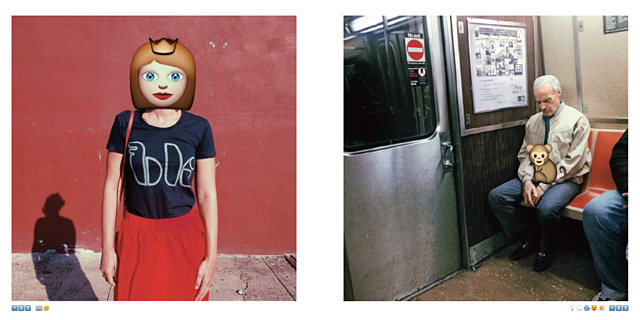 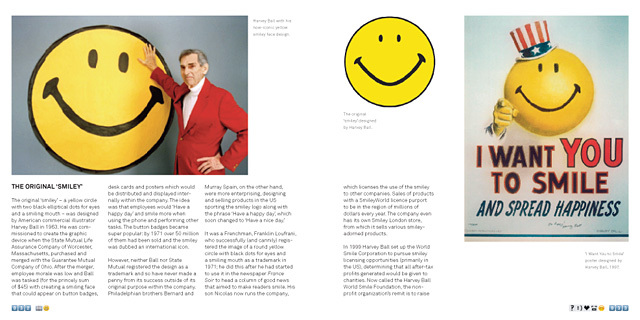 It also looks at an array of artworks, fashion lines, special character sets, advertisements, and projects that convey emoji s widespread impact on contemporary culture. 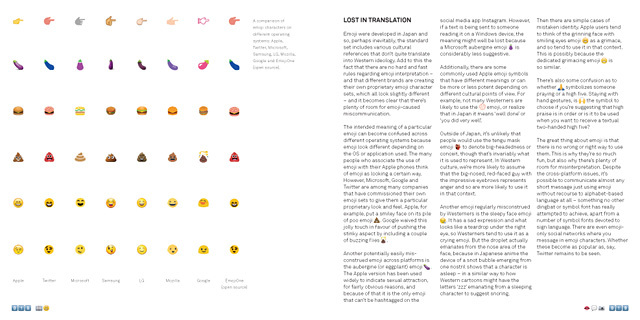 Finally, the book concludes with a section for which a group of illustrators, artists, and graphic designers have created original emoji characters they wish existed, including bacon, a vinyl record, and even a stabbed-in-the-back emoji. 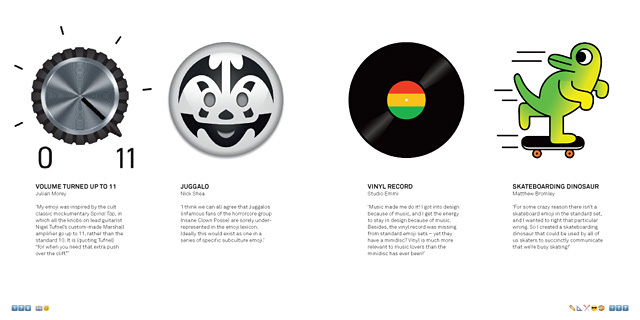 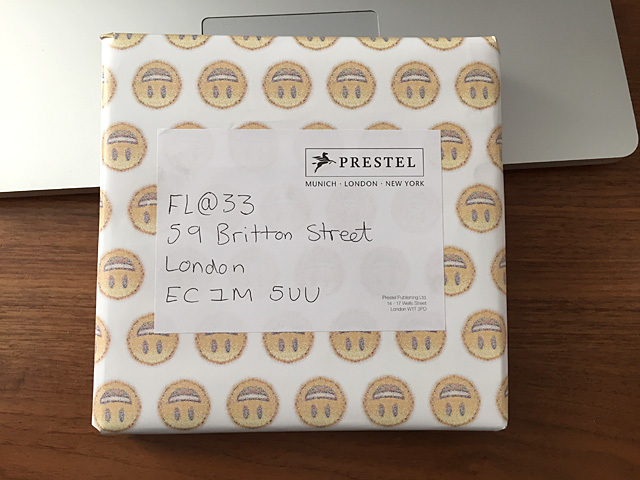 FL@33's graphic art label Stereohype collaborated with Gavin Lucas and 21 talents featured in The Story of Emoji to launch the Emoji Series – 31 button badges featuring bespoke emoji designs as seen in the book. 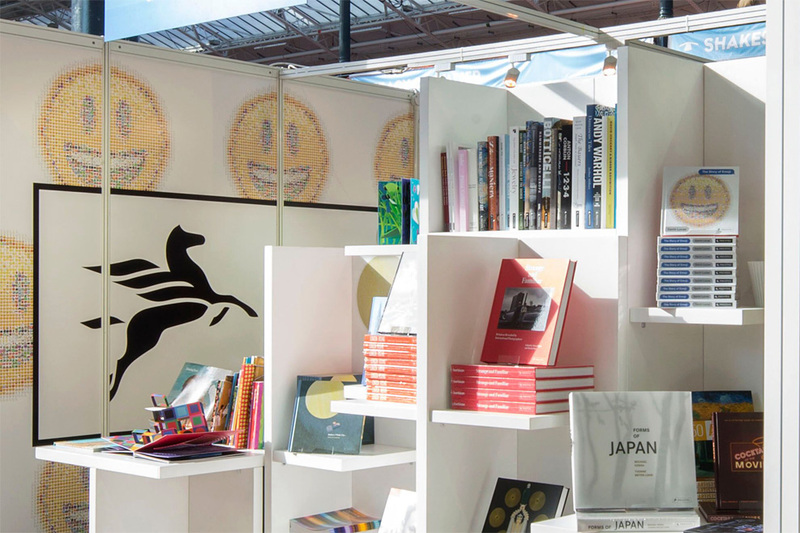 The button badge series launched as part of the book launch exhibition at KK Outlet, London, and its private view on 6 April 2016. 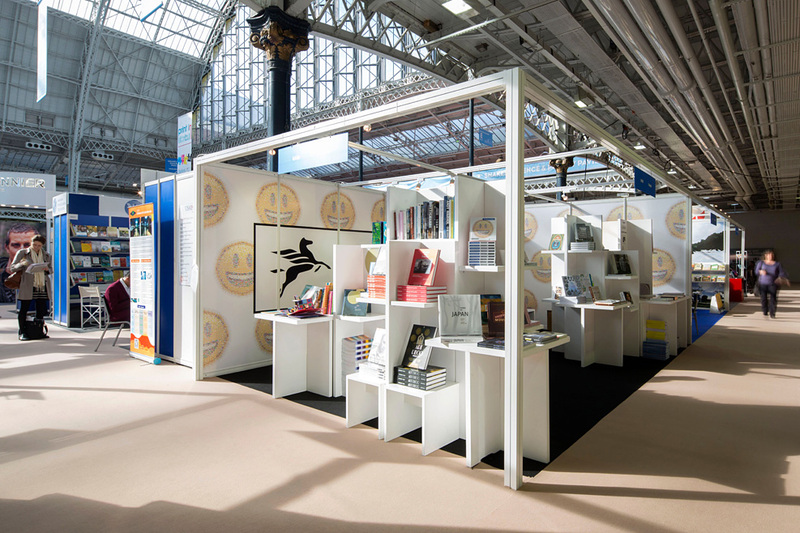 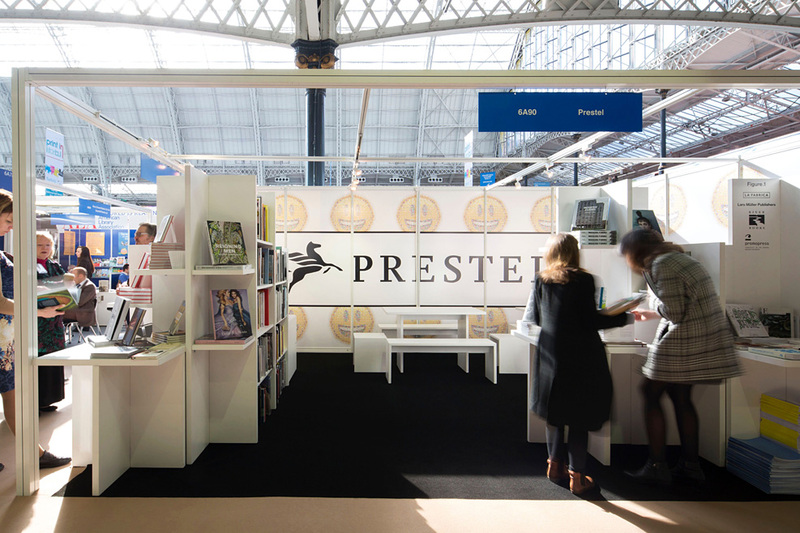 The four pictures of Prestel's London Book Fair stand 2016 are shown here with kind permission of Prestel Publishing. 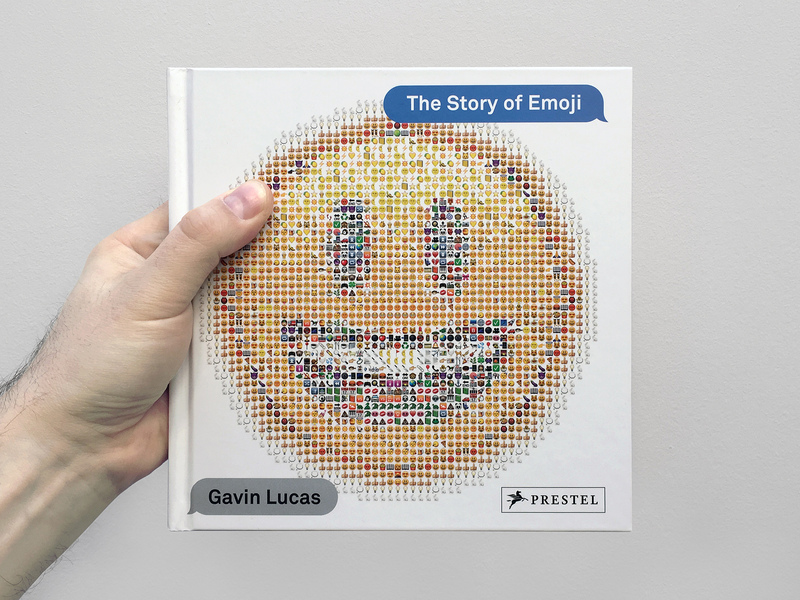 April 16th, 2016 — The documentation of the the book launch exhibition at London's KK Outlet for FL@33-designed book The Story of Emoji by Gavin Lucas (Prestel, March 2016) was added to our online archive. 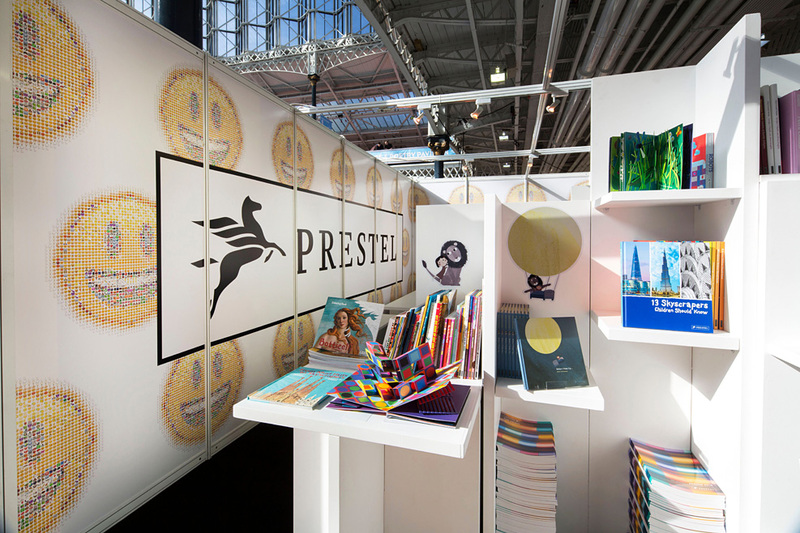 April 12th, 2016 — Prestel Publishing kindly allowed us to post some of their pictures of the wallpaper at their London Book Fair stand 2016 that proudly features our front cover illustration for the FL@33-designed book The Story of Emoji by Gavin Lucas. 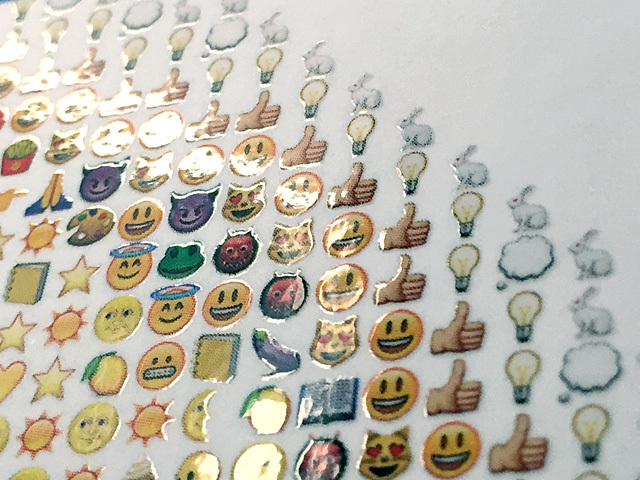 April 6th, 2016 — Tonight at KK Outlet and at FL@33's online boutique stereohype.com: Stereohype's Emoji Button Badge Series launches as part of The Story of Emoji's book launch exhibition at KK Outlet. March 4th, 2016 — The latest edition of html FL@33 Newsletter (#4) is out now featuring new work, out-of-studio-action and products. 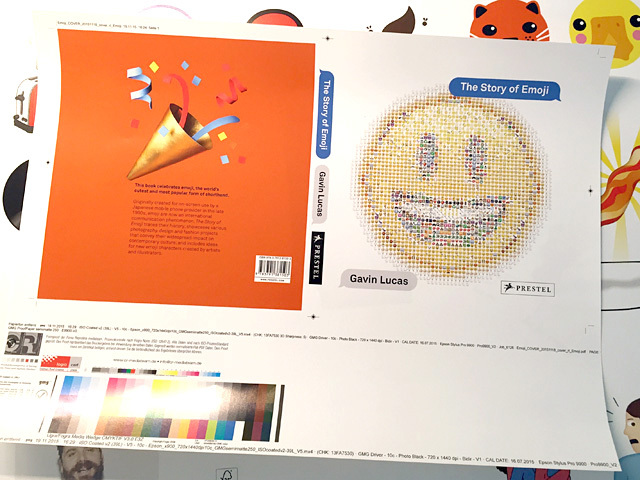 March 1st, 2016 — We posted some sample spreads of the FL@33-designed book The Story of Emoji by Gavin Lucas. 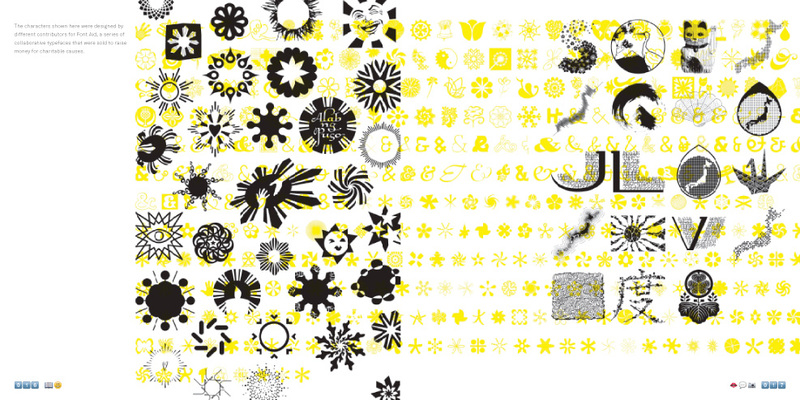 February 23rd, 2016 — FL@33's Tomi Vollauschek to run 4-day workshop and give lecture at ECV – Creative Schools & Community, Lille, France, 12–15 April 2016. 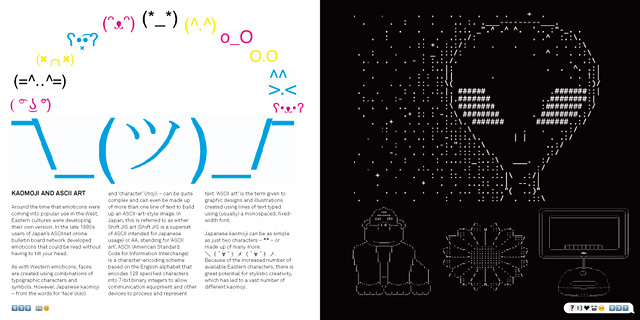 Lecture: 13 April 2016. 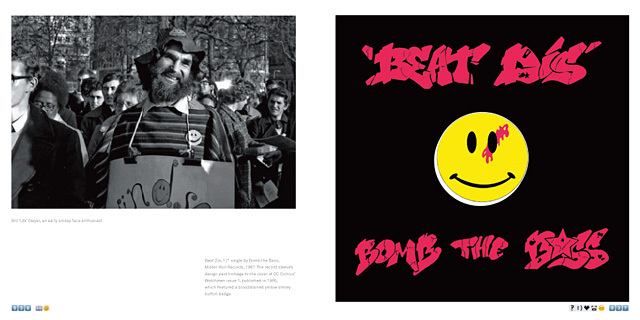 More info about this and other talks and exhibitions. 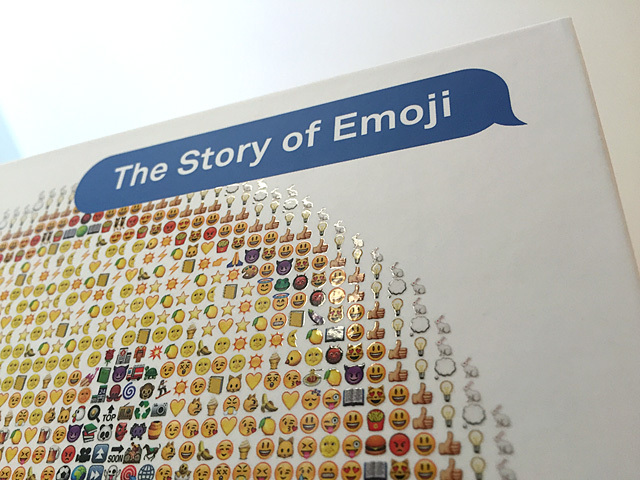 February 16th, 2016 — We received our advance copy of the FL@33-designed book The Story of Emoji today – a proper hardcover book for once – and we are happy to report that it looks amazing! December 18th, 2015 — We wish you happy holidays and a healthy and creative new year! 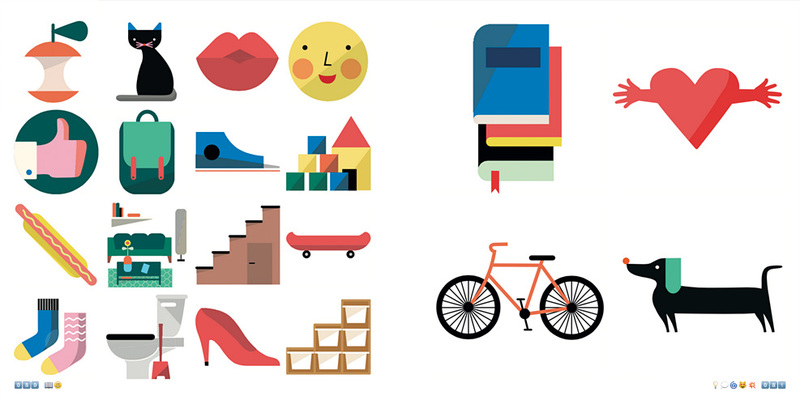 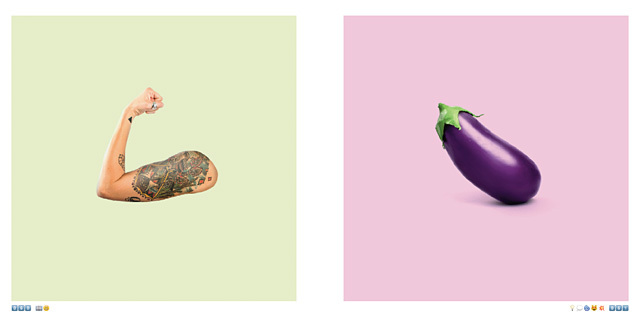 Enjoy this experimental emoji animation we created specially for your viewing pleasure. 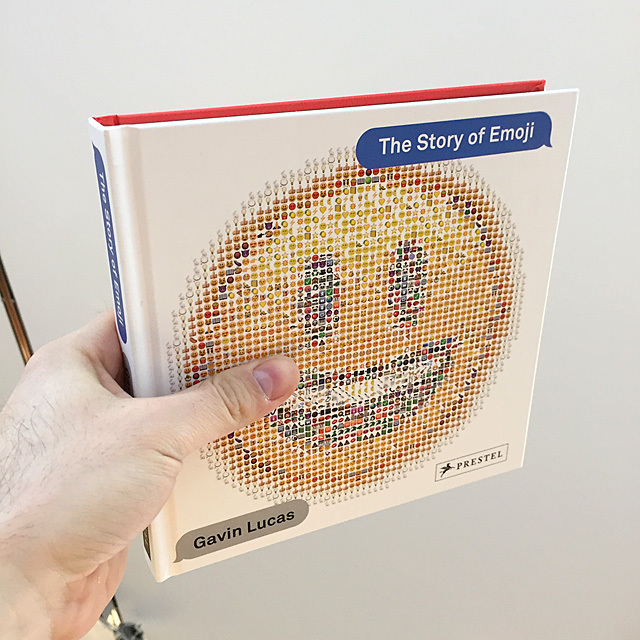 December 1st, 2015 — The Story of Emoji book design meeting at FL@33 HQ with Gavin Lucas and Ali Gitlow. 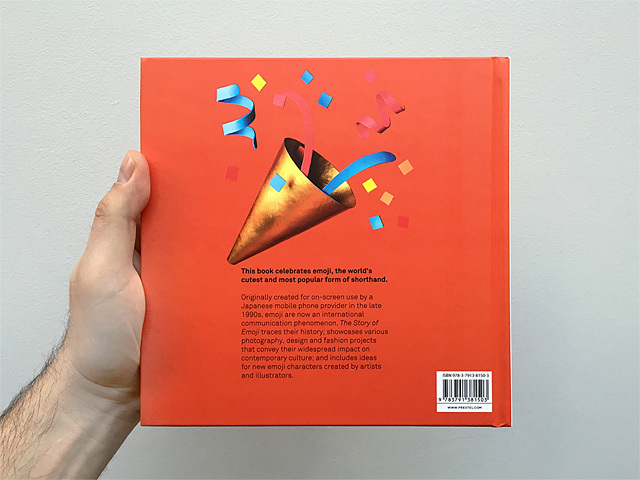 The book will be out in spring 2016. 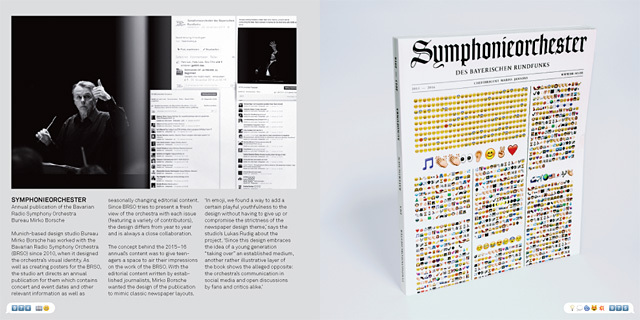 See the cover preview here.